Aia Arria is an Imperial bard at the Bards College in Solitude. According to her teacher, Pantea Ateia, Aia is the only student at the College with actual talent, a fact that Aia takes great pride in. Aia Arria wears a set of farm clothes along with a cowl and a pair of boots. She carries her key to the Bards College, a flute, a lute, and a selection of common loot and gold. She also wields an iron dagger and carries a belted tunic. At 4am, she will wake up and go to a class in the Bards College. She will move to a different class at 8am and again at 2pm. She will go to the market at 6pm; however, she also goes to sleep at 6pm, which is a bug in her schedule. Aia is extremely confident in her abilities as a singer, saying, "Lady Ateia says my voice is second only to hers. But she's selling me short." and "Few can resist my charms. Even fewer are worthy of them." She also compliments her teacher, saying, "Oh, if you haven't heard Dean Pantea sing, you should." Aia will also comment on Jorn's military aspirations saying, "I can't understand why Jorn would want to join the Imperial Legion. Soldiers only appreciate one thing, and it isn't music." She will exit conversation with "We should talk again sometime. ", except if you have completed Tending the Flames, in which case she will say, "Always glad to talk to a bard." During the lesson time at the Bards College, she may be seen having random conversations with her instructors. Pantea: "You there. Have you performed your voice exercises today?" Aia: "Always! Perfection takes dedication, after all!" Pantea: "Yes, well, see that you keep at it. That is all." Inge Six-Fingers: "Your solo performance is about a week away. I expect to hear your early rendition tomorrow, understand?" She was also supposed to converse with Giraud Gemane, but due to a bug, her line will never be heard. Giraud Gemane: "Pardon me, but I trust you've been working on your poem, on the classical heroes of Skyrim, yes?" Aia: "Must it be written? Poetry is so dull when it isn't set to music." Giraud: "I'm sure it will be fine. Just don't be late." Jorn: "What're you going to do after you graduate? I'm thinking of joining the Legion. I hear they're looking for skalds. Just think. Me - a war bard." 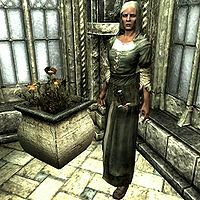 Aia: "Lady Ateia has already arranged for me to perform in the court of the Jarl of Falkreath." Jorn: "You'd better hope the war's over by then. The Stormcloaks would eat you alive!" Aia: "Hmph. Music tames the most savage beasts. Even Nords." Illdi: "Alaf keeps making eyes at me." Aia: "You should tell him to mind his own business." Illdi: "Aia. You're so mean. I don't think he means anything by it." Aia: "Have it your way, then." Pantea: "Your performance has been excellent lately Aia. You still need training but one day you will make an adequate singer." Aia: "Yes, Dean. Thank you." Aia: "Salmon looks good today." Aia: "There's nothing quite like a good vegetable." Jala: "Vegetables are the food of the Divines." Aia: "I've heard stranger things, [sic]are eaten over at the Temple of the Divines." Aia has setup errors for her market visit and sleeping. This issue has been addressed by version 1.2.5 of the Unofficial Skyrim Patch; Aia now visits the market at 4pm instead of 6pm, and sleeps from 7pm to 2am. Considerable dialog was written for Addvar and his various customers. Unfortunately, they were recorded in Jala's voice. Aia's dialog is mixed with Jala's other dialogue. See Addvar Bugs for this dialog.